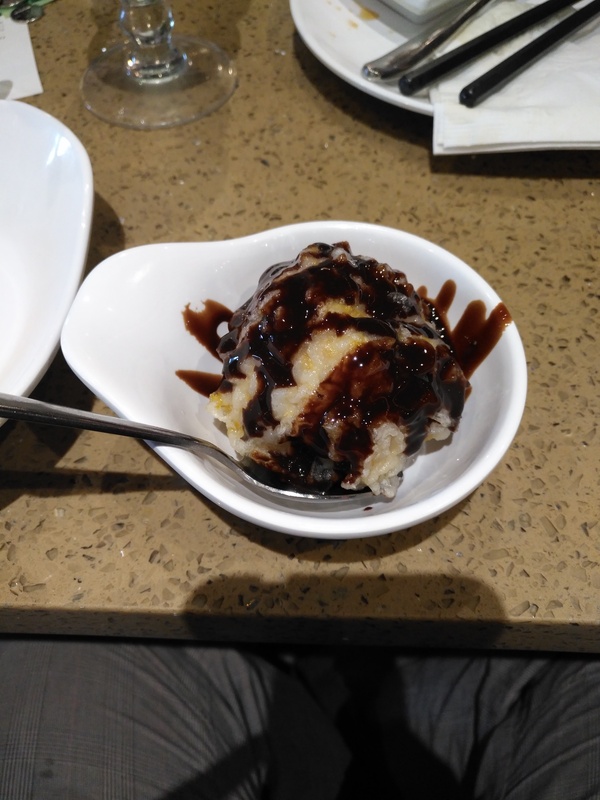 As a UWaterloo student, I have two options for nearby sushi buffets: ​Itamae & Sushi 168. Of the two, each has its strong points, weak points, and unique dishes. And so, that leads us to an issue… Which do we go to? This conundrum leads to the necessity of a guide. That last one is key for the employees. 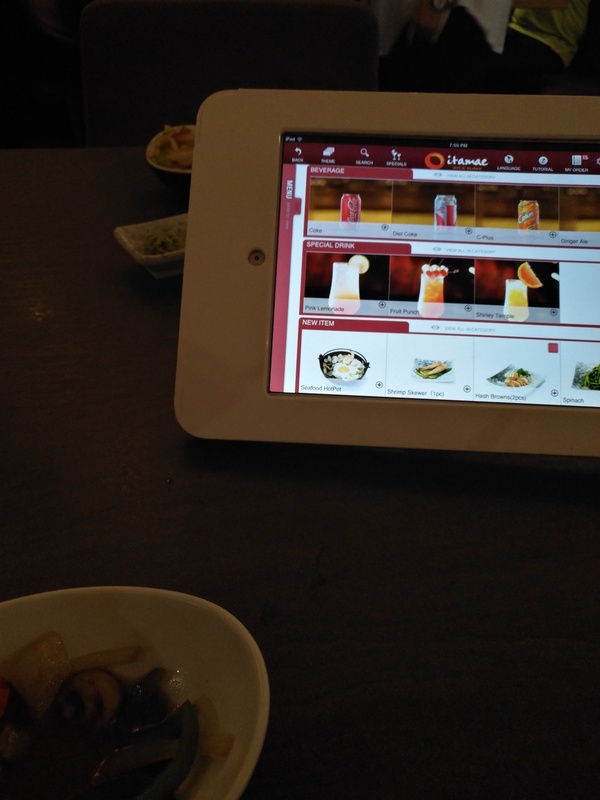 While Sushi 168 has an iPad ordering system too, the servers have to come to your table to confirm your order; whereas in Itamae, they can confirm your order remotely. This makes service faster and easier (supposedly). Doesn’t properly season their food – this applies mostly for dishes other than sushi/rolls. There just isn’t any salt. Some of their dishes are overcooked. For example, their spinach is left bitter. 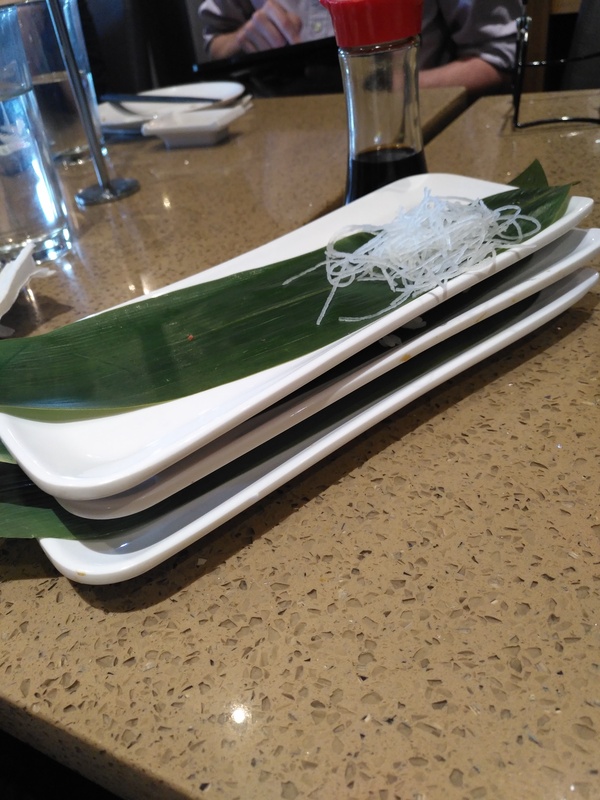 Their different dishes don’t stack well. Another hardship for the employees, but thankfully they don’t stay around long enough to have to stack too much. It’s harder to order if you’re vegetarian or have allergies – their menu lacks item descriptions and any indications of whether or not it’s vegetarian or has an allergen. 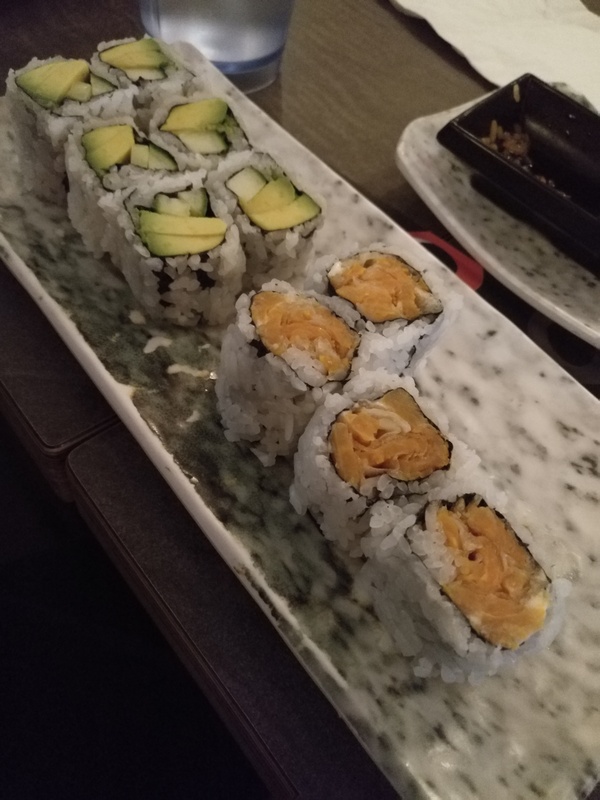 Some of their dishes don’t compare – in my opinion – to Sushi 168. 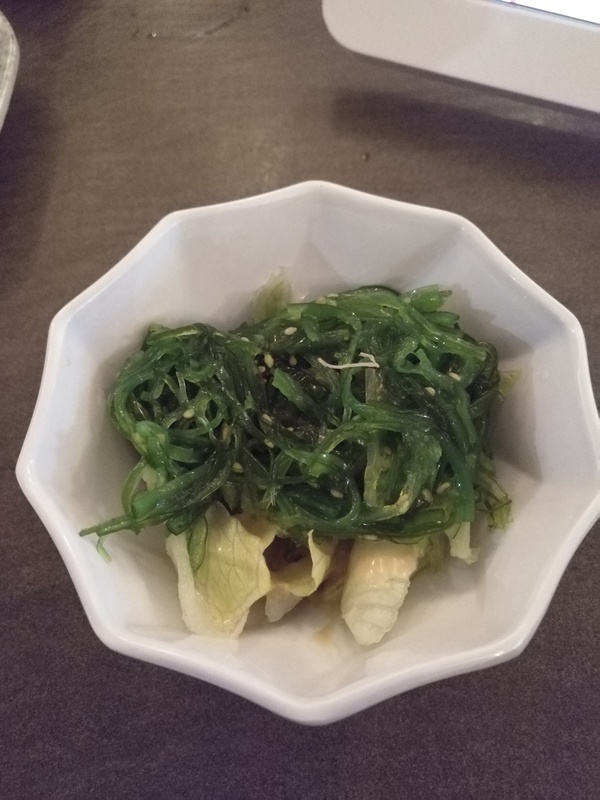 For example, their seaweed salad. For people who like alcoholic beverages or mocktails, there are fewer paid drinks available. The iPad, although ergonomic, is in the way once dishes start coming. 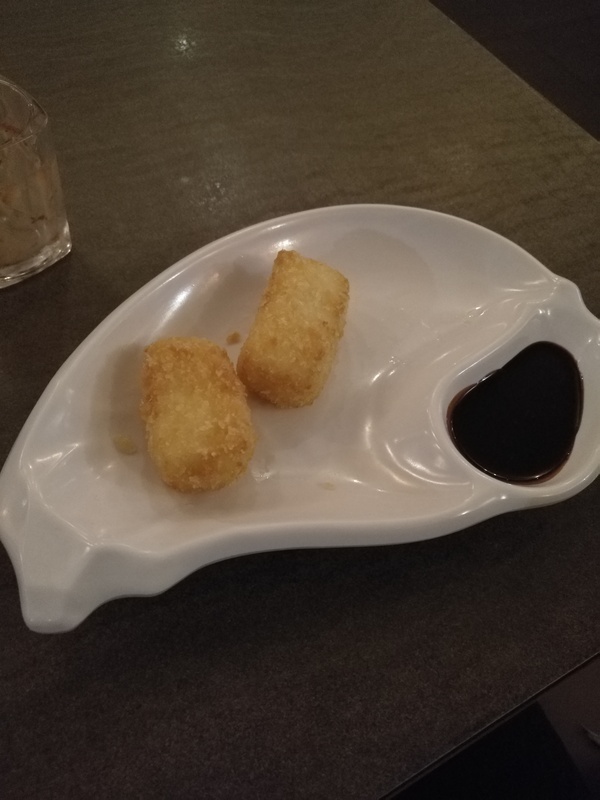 One unique dish that they have that I’d recommend trying is their hash browns. The hash browns look like sushi pizza, but are actually fried mashed potatoes with veggies inside. It’s actually pretty good, though it looks different from what you’d expect. In case you order both this and sushi pizzas, it looks like them, but is harder to grasp. A better system for recognising allergies and dietary restrictions. They will ask you for any allergies ahead of time, and there are symbols on their menu telling you if a dish has peanuts, if it’s vegetarian, and if it’s spicy. They also have more international cuisine types. They have a buffet for salads, soups, and some of the desserts, which makes it faster for you to get those things and choose how much you’d want. They also have more choices altogether, both in food and drinks. The restaurant is also more spacious. Their dishes also stack well, unlike Itemae. But that’s because they are more uniform in shape. They have a washroom that looks like it belongs in a 5 star hotel. They often have slower service than Itamae. Their sushi has veggies that are not as fresh as that Itamae offers. They have less veggies in their dishes – but they’re working on that. 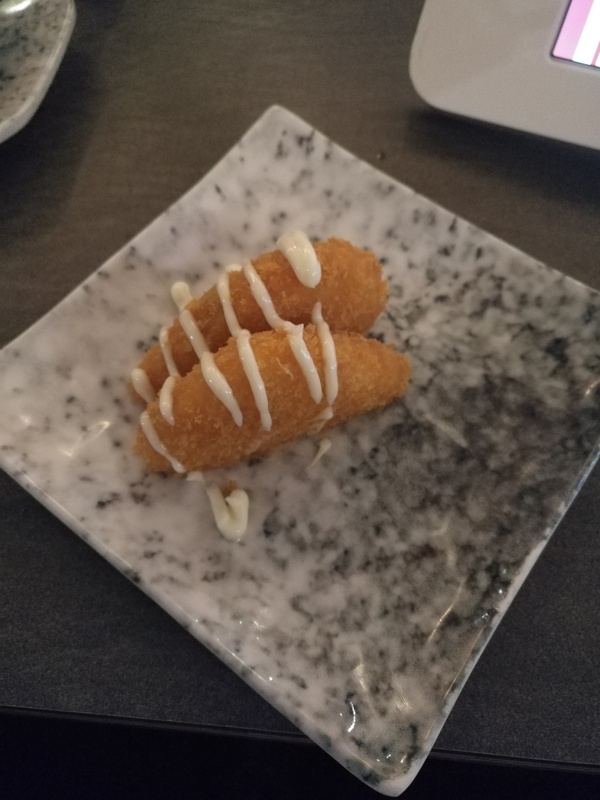 One unique dish on their menu that I’d recommend trying is their deep fried rice cream. It’s ice cream in a deep fried sweet coating that tastes like cornflakes. It’s covered in chocolate syrup and is generally delicious. Now that you know the ins and outs of the two all-you-can-eat chains nearby, go on and make an informed decision. Foodie Fruitie: is it filled with goodies? I’ve been on a quest to eat at every restaurant in the plaza, which for me includes the places in Linden Square at the intersection of University and Lester. 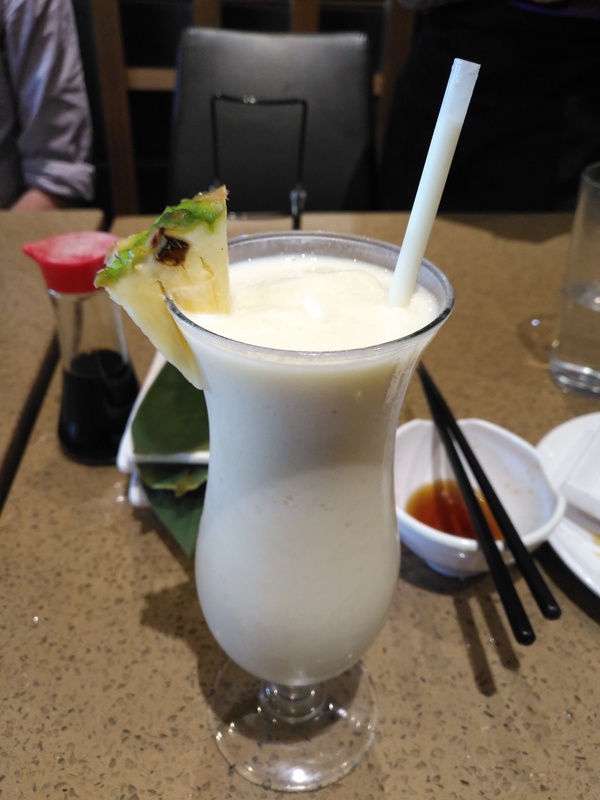 Foodie Fruitie is an Asian restaurant with a large menu, including skewers, sushi, ramen, rice dishes, tea, and more. I like to come here for late night snacks and filling rice dishes for lunch. I almost always order the rice sets at Foodie Fruitie, which are combos that include rice, soup, and salad. The portions are pretty big and I usually can’t finish it and have to take some home. One favourite of mine is teriyaki salmon. The rice set is nine to ten dollars before tax which is good for what you get. I’ve tried a few sushi items from the menu which were decent, but not so good that I’d recommend it over the other sushi restaurants in this area. Foodie Fruitie offers a variety of tea- and juice-based drinks. 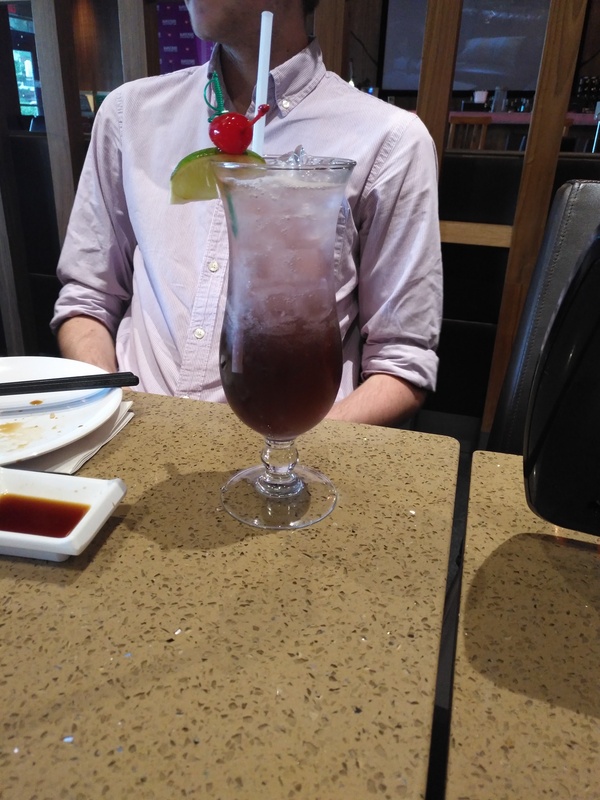 I’m not too familiar with their drinks since I’ve only ever ordered one drink, the watermelon juice. It was decently fresh and there was no sugar added. I probably won’t order it again because the portion is a bit small for me. If you like beer to go with your meal, there are some common brands available here (I had Sapporo here which I liked with sushi). One thing that I like about this place is the complimentary food you get. 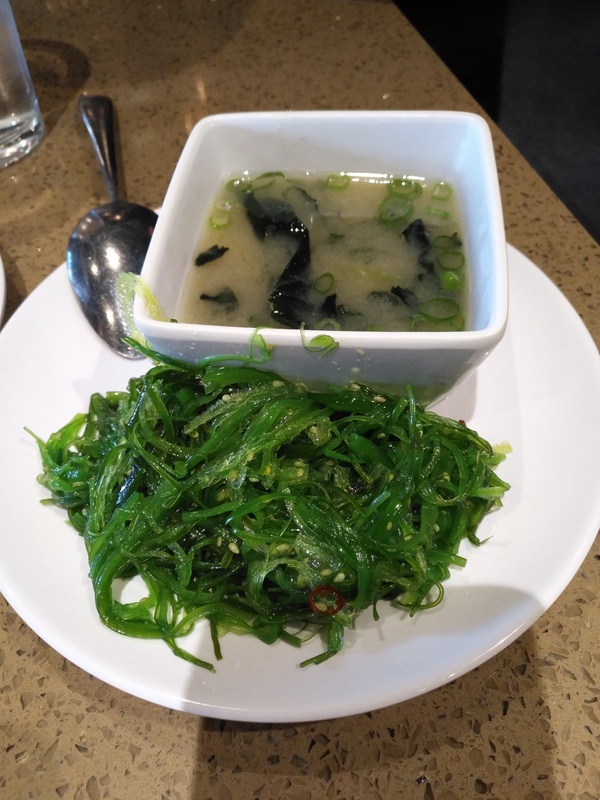 There’s seaweed salad before every meal. I came here with a group and we got complimentary takoyaki. 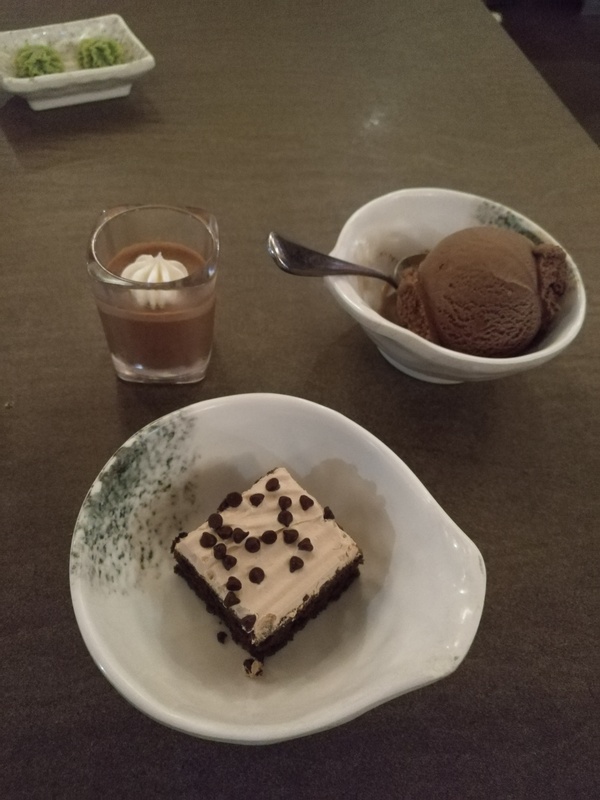 You should get free ice cream at the end as well, although I had to ask for it when I was eating by myself. Now on to what I dislike about Foodie Fruitie. The service isn’t great here, especially when it gets busy. Sometimes it’s hard to even get someone’s attention to be seated. It almost always takes a while for a waiter to pick up your order. I’ve tried one of the ramen items here once and I would not recommend it at all. I remember it tasting of salt and nothing else. I’ve also heard only bad things from my numerous friends who have tried the ramen at Foodie Fruitie, so it isn’t just my opinion. Try to avoid the ramen no matter how good the menu pictures make them look. Grace & Healthy Dumplings: Is there Healthy Food in the Plaza? I’ve been on a quest over the years to eat at every restaurant in the UW plaza. After much trial and error, I can safely say that Grace & Healthy Dumplings is my favorite restaurant in the plaza. The food here is tasty and healthy at a reasonable price: I spend only $13-$15 here each time for a filling meal. Grace & Healthy Dumplings sells… you guessed it, dumplings, but there are some other options as well, such as congee, buns, and appetizer dishes. “Healthy” is right in the name, and the dishes Grace & Healthy Food do taste healthier than your average plaza food. Nothing is overly salty or greasy. I find that there is a healthy balance of meat, vegetable, and grains on the menu. Grace & Healthy Dumplings is MSG free and their meats are grass fed and local. The Dumplings have a range of different stuffing. My favorites include chicken and zucchini, chicken, napa cabbage and chives, and pork and kimchi. However, there is a vegetarian dumpling as well. On the pricier end of the menu, you can get stuffing that includes seafood and lamb. For portion sizes, you can buy 12 or 16 pieces, boiled or fried. You can also buy some frozen dumplings for about a dollar cheaper and take them home to cook. 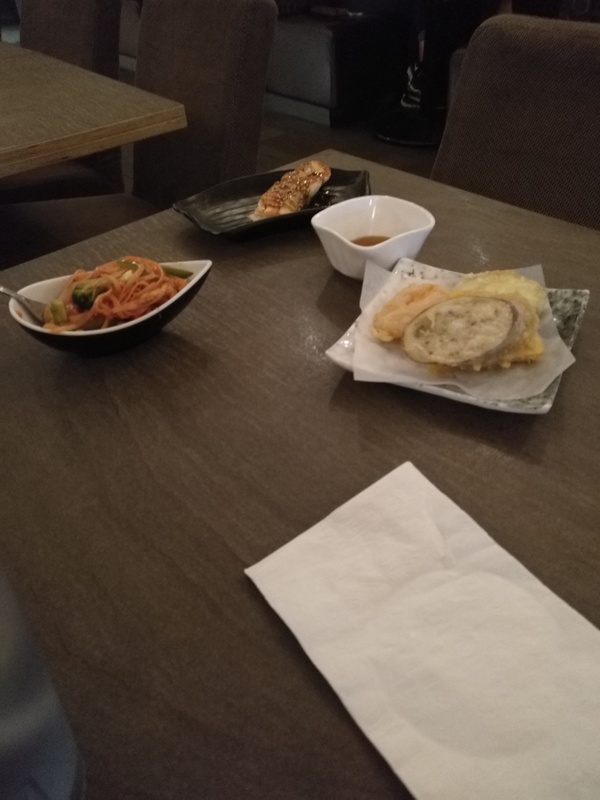 The side dishes all taste decent and they’re not too pricey – I order them at around 2 dollars each. What really impresses me is their organic congees. If you haven’t had congee before, the plain ones here are a good place to start. I really like the one with sweet potato and The congees at Grace & Healthy remind me of the staple congees that my parents make at home, which is no small feat. 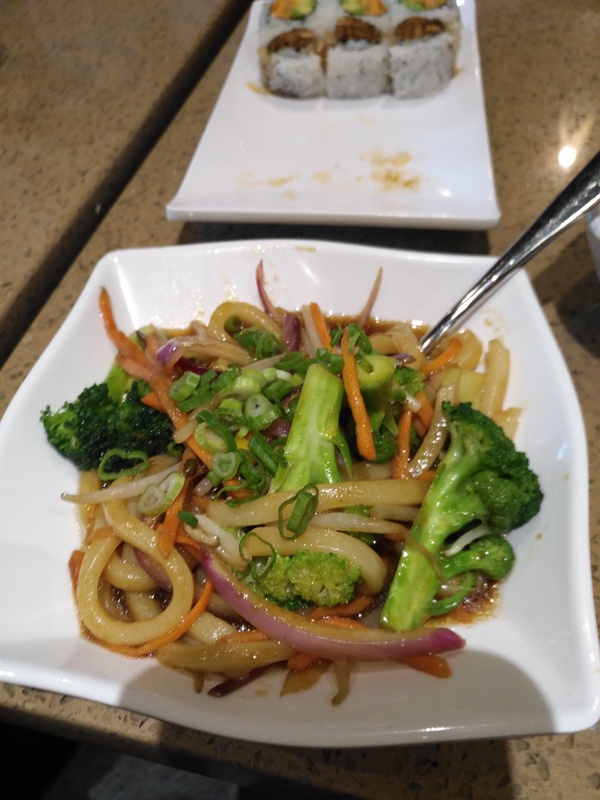 In addition to the original dumplings and side dishes, Grace & Healthy Dumplings has been adding items to their menu such as noodles, wonton, and rice dishes. They have good portions and taste well enough, but I rarely order them because the dumplings taste much better. There are things that I don’t like about Grace & Healthy Dumplings as well. Sometimes service can be slow, especially at peak hours. I’ve also had to ask for things like tea or water or spoons many times. Items such as congees and buns are sometimes sold out later on in the day. Overall the food at Grace & Healthy Dumplings is healthy and delicious, so give it a try if you haven’t yet! For all lovers of Italian food, fine cheeses, fresh pasta, freshly baked bread, and other tantalizing commodities, I recommend that you visit this Italian grocer in uptown Waterloo. It’s got a mix between an European small-shop atmosphere and a street vendor’s allure. Entering Vincenzo’s for the first time felt to me like returning to Israel for a shopping trip. The place is packed with goodies and has displays of fresh pastas, sweets, salads, etc. around every corner. At the same time, it also sells hot food in-store. It’s really the perfect morning or afternoon getaway. You can casually browse its many isles and discover Italian brands and Vincenzo’s store brand goodies. As nice as fine cheeses are, they can get expensive expensive. When I discovered Vincenzo’s, however, it changed the way I go about shopping. It’s cheaper than other grocery stores I’ve been to and has much more variety. Vincenzo’s has their fresh dips and fine cheeses. Their dips are homemade and much more fresh than you’ll get at any other grocery store nearby; I think this is a worthwhile investment. Next, their cheese collection has two serve-yourself fridges, as well as a walk-up service counter. They have so many types of cheese that it’s really quite hard to choose what you want. To top it off, they have several types of some of the cheeses. My favourite dips to get at Vincenzo’s are their fresh cream cheeses and their chipotle aioli. Fresh cream cheese is easier to spread than brand-name cream cheese sold at grocery stores, and it tastes better to boot! I highly recommend trying it, even if it’s just the one time. My previous roommate didn’t even like cream cheese, but she once tried some from Vincenzo’s and fell in love. You can honestly taste the difference. As for the chipotle aioli, I occasionally add it to my sandwiches for a bit of spicy goodness. It can also be used as chip dip or as pizza dipping sauce. This aioli isn’t necessarily for everyone, as it’s not overly spicy and has a sweet tang to it, but I personally love it. These goat cheeses aren’t Vincenzo’s in-store brand, but I really like the garlic & herb and garlic goat cheese. They also have dill goat cheese, and that’s generally my next go-to (unfortunately sold out on my last trip).They have plenty of variety, so you could try something new every time. Vincenzo’s also carries a fantastic Queso Fresco. It’s very fresh and tastes fantastic. Also, it saves you the time of making your own from scratch if you enjoy doing that. I’ve made some on occasion, but it was never quite as good as the Vincenzo’s Queso Fresco, so there’s really no point when there are specialists willing to sell it for a decent price. As a cheddar person, Vincenzo’s doesn’t disappoint with their variety. My favourite full-bodied cheddars are their Charwood, Double Smoked, and Maple Smoked Cheddars. My go-to is the Maple Smoked Cheddar, but they were sold out on my last trip. The Double Smoked is a good replacement for its smokey sibling, but not quite the same. The Charwood cheddar is something I’ve never seen outside of Vincenzo’s. Its hearty applewood flavour is quite addicting, and the paprika only adds to its charm. I highly recommend it to all cheese lovers. The Pine River Caramelized Onion Cheddar is a more subtle-flavoured cheese, but still quite nice. It makes a great grilled cheese, and Vincenzo’s always keeps a steady supply. Another really nice cheese they keep on stock is their Rosemary and Olive Oil Asiago. Although I didn’t get it this time around, the cheese is a staple for all cheese and cracker lovers. It’s mild, but the rosemary and olive oil give it a nice twist. Vincenzo’s carries many different meats, but since I’m vegetarian, I can hardly comment on them. There is a picture of some of their meats in the Dairy section above. Vincenzo provides both fresh and dried pastas. As dried pastas can be bought anywhere and for cheaper, I’ll focus on their homemade pastas, which are far cheaper than boxed fresh pastas you might find at other grocery stores. To highlight this, I bring you the cheapest but best fresh pastas to buy on a budget. The Spinach, Sundried Tomato and Basil, and Garlic pasta bundles are $0.99 per 100g and delicious. They don’t cost much and are a nice luxury every now and then. There is also ravioli and tortellini in the store, as well as fresh gnocchi. Vincenzo’s breads are nice and fluffy within and nice and crusty on the outside. The exception to this is their Ciabattas, which are generally fantastic. The herbed ciabattas were gone, but “Hamburger Ciabattas” were still in stock. The Ciabattas are a must at any Italian bakery, and Vincenzo’s is no exception. They also have other international breads, such as the baguettes hiding in the corner of the store. Even their pizza crusts (on the bottom shelves in the picture) are worth getting every once in a while. Freshly baked buns sell out quickly, so come early if you like those. Vincenzo’s also has other products you may not have thought of. They sell sushi, which is surprisingly good for an Italian place, but there isn’t much variety. What they lack in variety in the sushi isle, however, they make up for in the olive department. Vincenzo’s has an entire self-serve counter for olives. With this much choice, olive connoisseurs are sure to be pleased. Vincenzo’s also offers a salad bar. Pasta, couscous salad, and food such as savoury baked goods are offered at this counter. You’ll wonder if you’re at an Italian grocer or an international food store. P.S. The samosas are pretty good too. Vincenzo’s has a variety of hot food stalls throughout the store. The one I most recommend is their hot sandwich bar. You can get any sandwich under the sun with their in-store brand cheeses, meats, breads, and veggies. The lineup for sandwiches can get pretty long; fortunately, you can order a sandwich on Vincenzo’s website and pick it up without waiting in line to order. There are also other hot foods such as veggie lasagna, which is excellent. You can finish your afternoon of shopping or eating with Vincenzo’s bakery’s sugary goods or their collection of teas and coffee mixes/beans. There are mini cakes and tarts available for purchase. My friends have bought some and have assured me that they are fantastic. Something I have allowed myself to indulge in is the tea collection. There are many brands and types of tea available. For example, I am the proud owner of a tin of Strawberry Chocolate tea from Vincenzo’s. It’s a caffeine-free Rooibos which I highly recommend to all dessert tea lovers. As a tea lover and abstainer from coffee, I can’t talk much about their coffee collection, but it is extensive as well. Finally, one of the cash registers happens to be the Vincenzo’s Cafe register, where you can get treats – including gelato! There are seats available where you can sit and eat. Their gelatos are great, and my favourite is the basic chocolate. As of writing, Vincenzo’s still has their Christmas items in, and is currently having a 50% off sale. I’ve bought some of their Christmas chocolates on the way out, and although ’tis no longer the season, the chocolates still tasted great. This brings us to the end of our shopping trip. Perhaps we will have a dine out at Vincenzo’s soon so that you could see for yourself whether a short trip uptown is worth a little taste of Italy. Campus pizza… is it worth it? Just yesterday, I had the opportunity to try out some fresh pizza from Campus Pizza at the University Plaza. Campus pizza is completely different from the other pizzas I’ve had. Contrary to pizzas being salty; this pizza had a tinge of sweetness. However, there is also the option to add spicy sauce to your slice of pizza so that is a plus. I mean, who doesn’t like spicy foods? Another plus is the affordable price for an entire pizza. I have never paid $6.99 for a large pizza in my entire life. I know it’s their anniversary special but to offer decent pizza at a decent price is unheard of at Waterloo. Key Word: decent food. If we look at the rivalling pizza store (Pizza Nova), they have a pick up special for a large pizza priced at $9.99, three more dollars. We can conclude that Campus Pizza is slightly better in terms of quantity and quality for their price. Deals like this also help show that smaller restaurants care about customers even if their brand is not famous. Therefore, I can assure you (99.999% true – I’d like to not be held accountable) that no regrets will be formed towards purchasing a slice of delicious pizza at Campus Pizza. Have a spectacular day. First time at The WORKS! If you’re an upper-year student then you’ve almost definitely heard of The Works, a burger joint in uptown Waterloo. However, as a first year, I had never been there until last weekend and boy was it an experience! The Works has an industrial theme from the “cups” to the food to the washrooms, everything just captured your attention. When I first entered, I noticed that there was a literal fence separating the tables and the entrance and that the washrooms were referred to as “waste disposal” sites. Then when they brought in water, instead of cups they served it in measuring cups. If you think that’s crazy, wait till you hear about the menu! Ordering a burger works a little differently at The Works. You get to choose a patty and bun but the biggest decision is choosing a style of gourmet burger. These range from the “Getting’ Piggy With It” burger which features Canadian bacon, smoked bacon, cheddar, smokey BBQ sauce and crunchy onions to the “Fire Station #6” which comes with avocado, salsa, sour cream, and fresh jalapeno peppers. Some of their other crazier burgers include the “Trudeau Burger” and “Born to Brie Good Charity Burger”. Do keep in mind that most if not all of these burgers have more than one thousand calories and probably aren’t the best for your health even if they do taste amazing! The burger that I had was the “war pig” with sautéed mushrooms, smokey BBQ, cheddar and thick cut maple bacon. I don’t want to “boar” you with the details, but it was “porky” good (I’ll see myself out). I even switched it up last time by trading the regular patty for an elk patty (which is four dollars more expensive). I ended up really liking it since elk meat is lighter than their regular patty and is also healthier. The burger was really well put together and definitely one of the best burgers I’ve had recently. I also ended up trying one of their Oreo cookie shakes since at that point I was beyond trying to salvage my health. I was initially confused since the shake was served in a literal measuring cup but luckily for me, the shake ended up being just as good as the burger. Overall, the meal was delicious and I see myself coming back hungry for more. The Works is in uptown Waterloo on 92 King St South. I definitely recommend it, even if it is slightly on the pricey side for a burger joint. However, if you do end up going, be prepared for one crazy experience! I’ve been trying to find an Asian bakery near the UWaterloo campus for a long time. Back home in Calgary, my parents and I drove to T&T for groceries every weekend, and I would always buy some delicious buns from their bakery. Unfortunately, or fortunately for my health depending on how you look at it, Asian bakery options are not as abundant here. I recently came back to Waterloo after being away for a while, and imagine my pleasant surprise when I found that there is a new Asian bakery right on Philip. O My Bakery is located a short walk away from campus at Blair House. This bakery sells a diverse variety of pastries, ranging from sweet to savoury. I think the buns are very fairly priced: most items I tried are about $1.50 per bun after tax. My personal favourites are the pineapple buns (if I have to choose, I’d go with the ones with custard filling), the black bean bun, and the egg tarts. The egg tarts here might be my favourite egg tarts ever. The crust is the perfect texture and the filling satisfies my sweet tooth without going overboard. I’ve also tried the green tea bun, swiss rolls, cream cheese buns, and custard buns: basically all sorts of buns. Personally, I would recommend most of them except for the green tea bun, which sounds good in theory but it does not taste like real green tea at all. I haven’t ventured into trying the savoury buns yet, but I’ve heard good things about the pork buns. The drinks menu is filled with the usual items such as milk tea, coffee, and hot chocolate. The drinks all come in hot and cold; hot versions are around two dollars while cold drinks are more expensive. I have tried the Hong Kong milk tea, which was decent for the price. I’ve also tried the bakery’s soy milk a few times and it tastes freshly made, which is a huge plus. Disclaimer: I wrote a bit about the attached restaurant, iNoodle. Unfortunately one of the workers at O My Bakery just told me that all of the food on the menu will be eliminated soon. O My Bakery is half-bakery, half-restaurant. The other half is iNoodle, which serves noodles and some Chinese breakfast foods. My favourite dish is the sliced noodle with tomato and egg sauce. I’ve tried their beef noodle as well, but it lacked in beef and flavour. I’d like to try more breakfast foods options when I get the chance. Side note: O My Bakery is open until 10 pm. If you’re looking for some late night snacks, a lot of the buns sell out by this time, so try to come earlier if you really have your heart set on those black bean buns. O My Bakery is my favourite new addition in the UW plaza area. Make sure you give it a try, especially if you have a sweet tooth. I’ve heard good things about Hot Wheels Tea House too, that will be my next stop in my quest to find and eat delicious bakery items. Yes that’s right. Midterm season is at its end and it’s time to reward yourself with what you like; a nice, cold (or hot), beautiful, creamy, smooth, nice –did I already say nice? – Cup of beverage at Sweet Dreams! While there, you may also purchase me a Moshi Moshi Matcha bubble tea –which is the green one down there- or the chocolate flavoured bubble tea –the brown one down there– as a gift. Wait what? Jokes aside, they have a large amount of drink combinations that could leave you spending hours and hours trying to finally figure out what you want but then end up not buying anything (which is exactly what I did once). You may end up wanting several drinks but then realize you are broke. Perhaps you do not know but there are many other possible things to look at while standing in a long line waiting to order your beverage. You could: grab some hot food items like a Panini or a pack of 6 spring rolls or buy a large bowl of shaved ice or buy a piece of cake, all for a decent price; rent out some board games; purchase some socks for your girlfriend; and maybe even donate spare change for your Pokémon Go team (yes Sweet Dreams is a hotspot). You should really try it out, but it’s really up to you. Really. Up. To. You. So you should go here. Now. OPEN 11AM-2AM ON WEEKDAYS, 12PM-2AM SATURDAYS, & 12PM-12AM SUNDAYS! SWEET DREAMS IS YOUR GO-TO FOR BUBBLE TEA!